Sometimes, Dim Sum with the Mother-in-Law is akin to a full body wax a la Steve Carell (in the 40-year old Virgin). Hence, I was in the process of making my appointment at Stripped Wax Bar when Viv appealed that it was her mom's birthday. 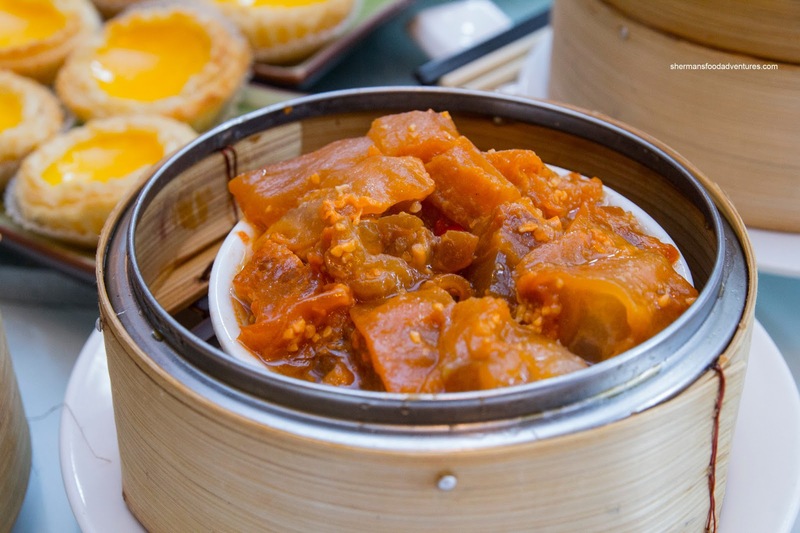 Oh fine, we'll go for Dim Sum. 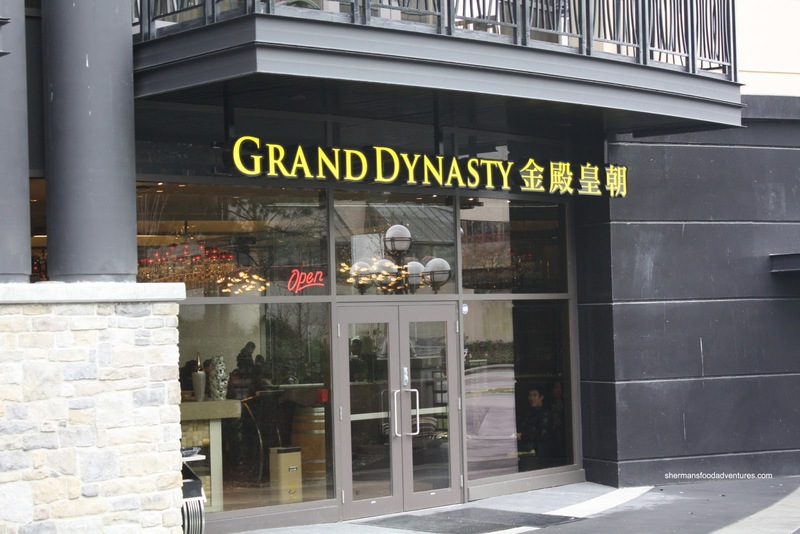 Maybe she'll be on her birthday best behaviour and only yell at one waiter this time... Due to the nature of this Dim Sum meal, we decided to head over to Grand Dynasty because of its "higher class" dining. 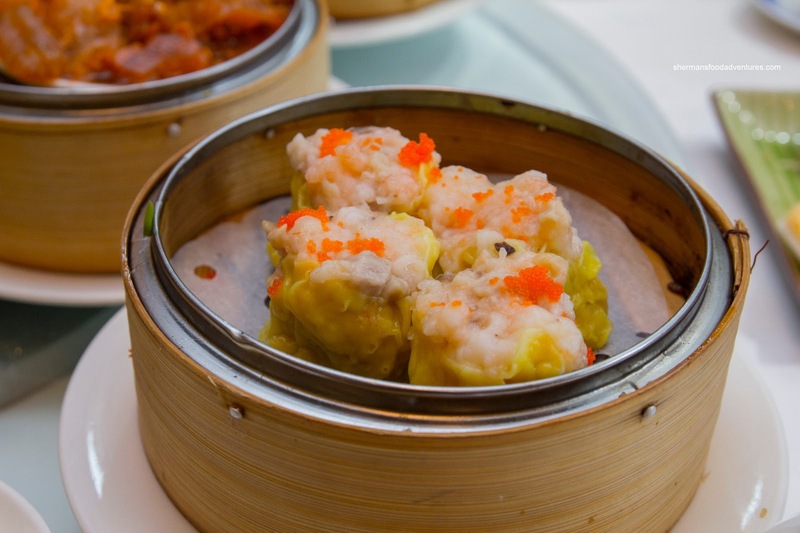 Sounded good to me since I haven't been back for Dim Sum since its opening. We started with a slightly different version of the Baked BBQ Pork Buns. 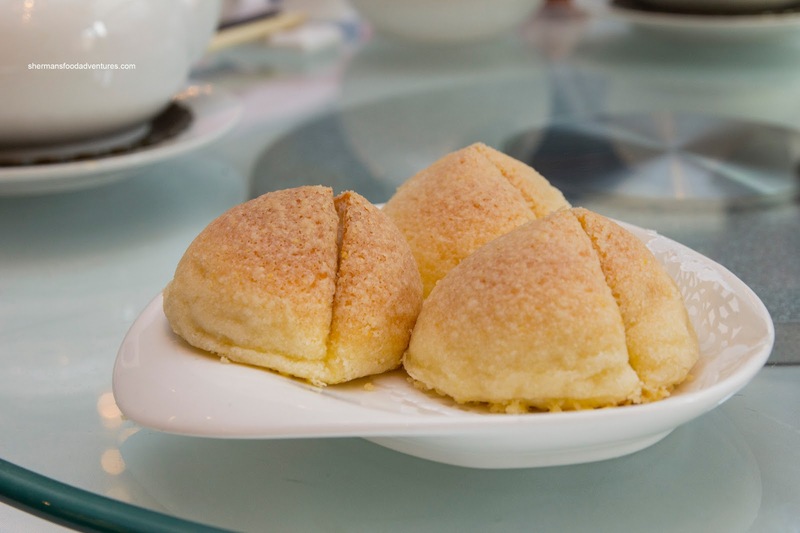 These are known as Gwai Fei Bao where the top of the bun has a layer of sugar which offers up sweetness and a slight crispiness. This version was good as the dough was soft and airy while the BBQ pork filling was tender and exhibited a good balance of sweet and salty. 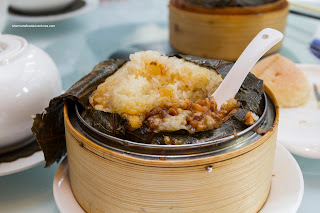 The kids were starving so it was a blessing their favourite item, Lo Mei Gai (Sticky Rice) showed up early. Unlike the mini ones found in most Dim Sum services these days, this was an ol' skool honking huge one. Hence, it was more moist with a lot of filling. The ground pork was tender while the ample amount of dried shrimp added a nice aroma. However, with so much filling, it did make the entire thing a bit wet. Moving on, the food came fast and furious where we literally ran out of room on the Lazy Susan (like it always does at Dim Sum). The Steamed Spareribs arrived in a good portion size where the meat was chewy in a good way. It consisted of generally meaty pieces where it was bone rather than cartilage. There was also very little in the way of fatty chunks either. The dish was well-seasoned with some spice and plenty of good pork flavour. 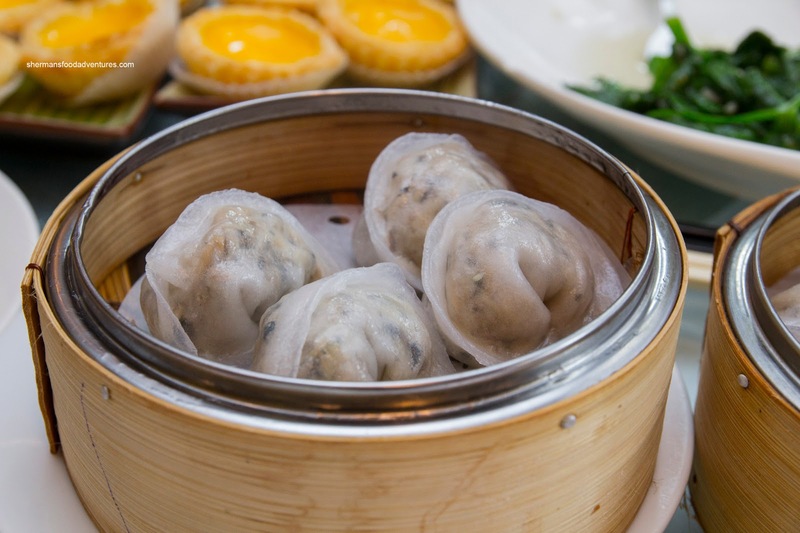 Our next item was very different being the Steamed Italian Black Truffle Dumpling. It was a combination of mushrooms and of course, black truffle. Hence, it was super Earthy with a nice gingery hit. 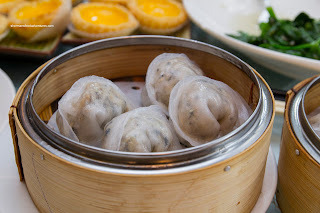 The skin was thin and chewy while the whole dumpling was pleasing in texture. Onto the most important item, the Haw Gow (Shrimp Dumpling) was pretty good. The filling was sweet with a wonderful snap while exhibiting just the right amount of moisture. Hence it was juicy, but not wet. 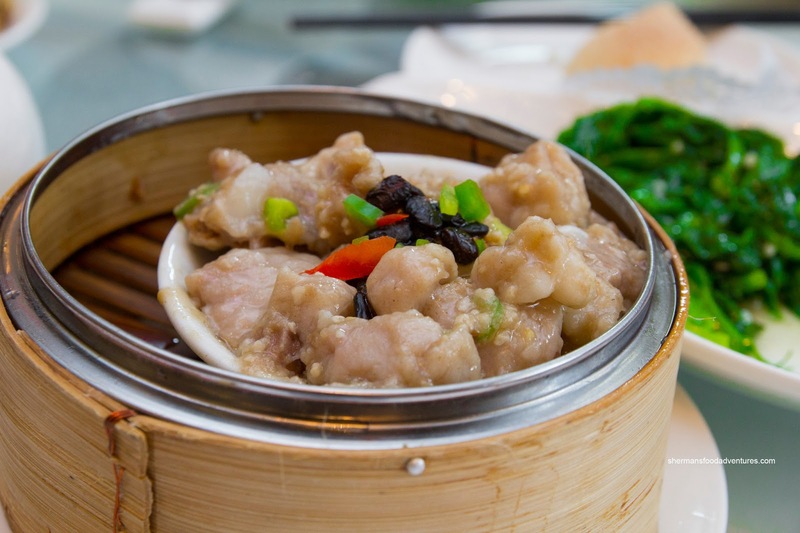 The dumpling skin was thin and pleasantly chewy. Adding to the natural sweetness was a noticeable amount of white pepper and sesame oil. 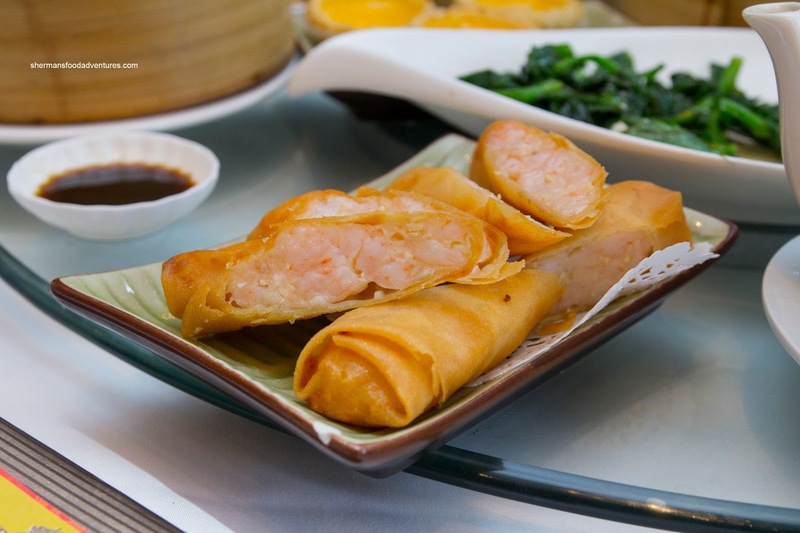 Furthermore, the inclusion of diced gai lan stalks afforded some brightness and colour. 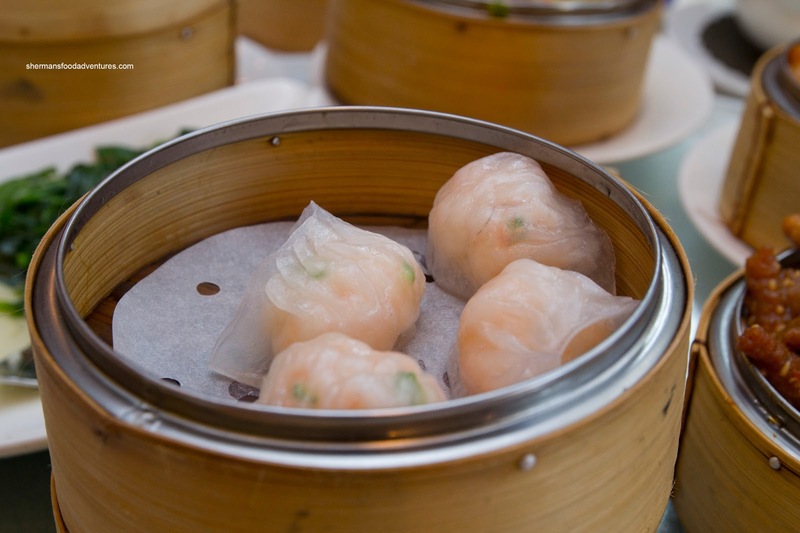 Of course we also had the Sui Mai (Pork & Shrimp Dumpling) which was comprised mostly of shrimp. Hence, there was a predominant sweet snap to the dumpling. With so little pork, I really didn't even notice it. Therefore, the flavour profile was mostly sweet without any real meatiness nor savouriness. Normally, we don't order lobster during Dim Sum, but it seemed like a good idea since it was offered on the menu for a fixed price. Sure, it wasn't a big lobster, yet for $20.98 it seemed like a decent value. The Sauteed Lobster in Superior Sauce with noodles was in fact a pretty good deal. 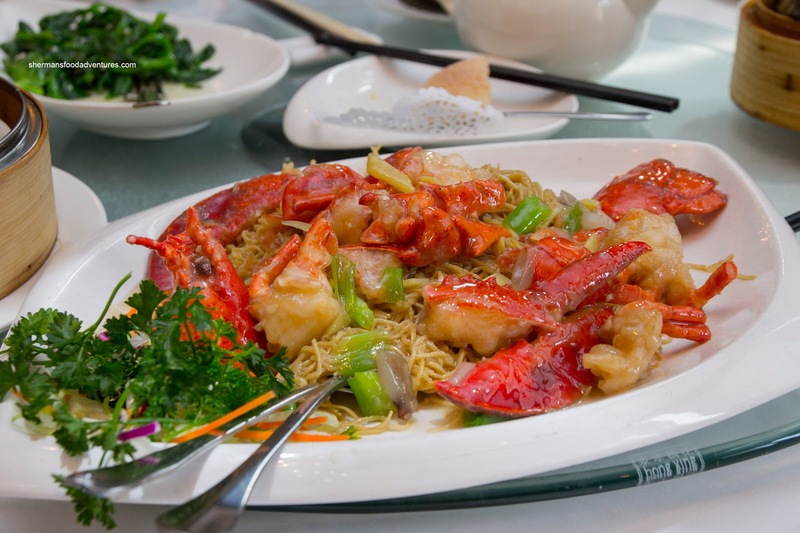 The nicely prepared lobster sat atop al dente wonton noodles which were caressed by a flavourful and balanced sauce. The lobster itself was actually decent in size. I don't have anything in common with my Mother-in-Law (thankfully...), but we both like offal, so I ordered the Steamed Beef Tendon. It was prepared just right where the texture was soft, while not completely melted into a mush. There was plenty of minced garlic which tasted good, but I found that they used far too much salt. We ended up getting both the Shrimp Rice Noodle Roll and the Beef Rice Noodle Roll as well (beef not pictured). In terms of the rice noodle, it was thick and somewhat doughy. Not bad by any stretch of the imagination though. 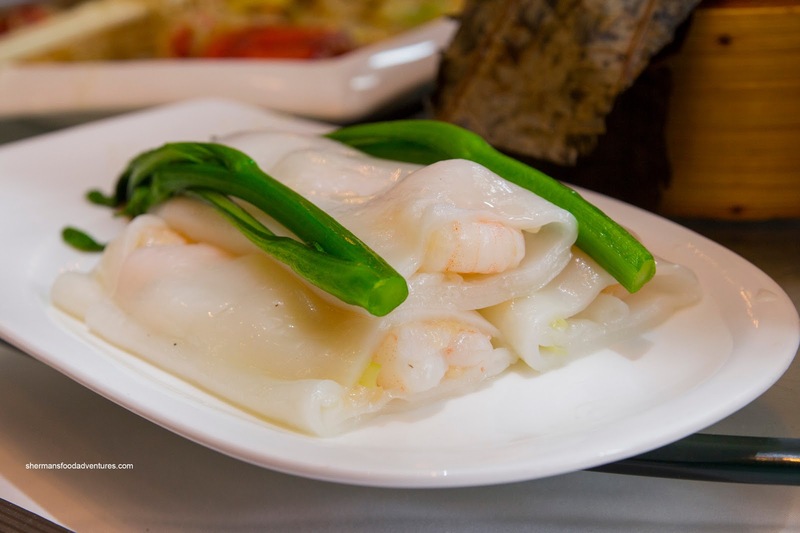 The shrimp filling had a nice snap where it was curiously bland (I guess that is what the soy sauce is for). I liked the beef filling more as it was tender with some bounce while exhibiting balanced flavour with a good hit of dried orange peel. 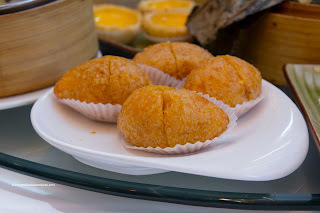 Moving onto some fried items, we had the Fried Glutinous Rice Dumplings. The layer of processed glutinous rice was thin, crispy on the outside and of the right consistency. With the addition of cane sugar, the colour was interesting while the flavour was sweet. The filling had a good amount of shrimp which was accented nicely by the crunchy preserved vegetable. My poor son had to wait nearly to the end for his favourite dish being the Shrimp Spring Rolls. I guess it was worth it because they were really good. There was a lots of crunchy well-seasoned shrimp packed within the crunchy wrapper. He ended up eating half of the dish (he needs to learn to share...). Lastly and surprisingly, the Egg Tarts were served at the end of the meal (a major feat for a Chinese restaurant). 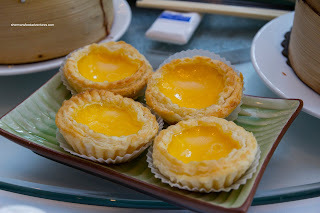 These were also very good being semi-sweet and silky with buttery and flaky tart shell. 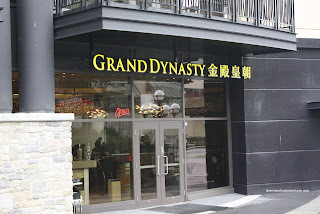 Although I've had some shaky dinners at Grand Dynasty in the past year, this visit for Dim Sum was very good. It is on the pricier side, but you do get the quality to back it up too.